TVS Motor has bagged a patent for its antilock brake system (ABS) for motorcycles. The new system helps to overcome the problems, defects and drawbacks encountered in the previous models. 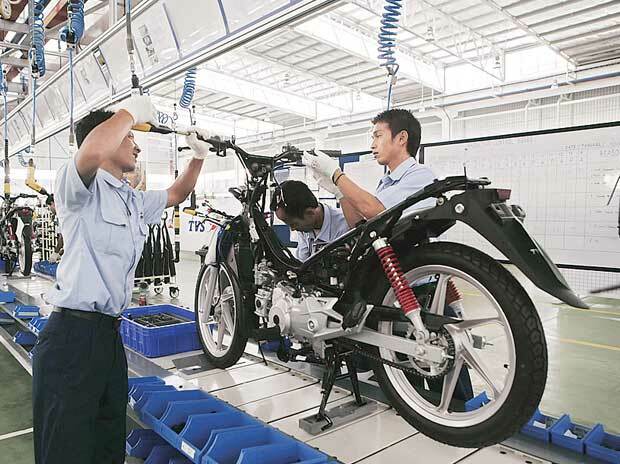 The company is currently using the ABS technology in its high-end motorcycle TVS Apache, in collaboration with German component manufacturer Continental Corporation. The company says that the presence of ABS in a motorcycle prevents locking of the front and rear wheels by automatically regulating the braking force acting on the front and rear wheels at the time of braking operation. The patent application was filed in December 2009 and the company claimed that the said invention would substantially overcome the problems, defects or drawbacks encountered in the known system. It is also meant to adapt an anti-lock brake system control unit in a two-wheeled motorcycle having a tubular frame construction with least modifications in comparison to the existing tubular frame construction without having a provision for ABS unit, it added. Another object of the invention is to locate the ABS unit near the centre of gravity in order to provide better stability to the vehicle and to optimise the brake performance by keeping, more or less, the same brake hose length for the front and rear. The invention is also to locate the ABS unit in a way in which it is easy for servicing without the need for removing any nearby parts and to utilise the existing free space available within the vehicle body frame, where the ABS unit can be located. The patent office raised initial objections such as that the claim does not have an inventive step in view of the previous inventions and a person skilled in the art would be motivated to combine the available information from the previous documents to come to a conclusion similar to the claimed invention, among others. The company claimed that the invention provided in the application has a technical advantage of maintaining a balanced centre of gravity in the motorcycle by placing the ABS unit in a particular location in the vehicle — keeping it at the centre of the motor cycle. This ensures equal distribution of the brake hose length between the front brakes and rear brakes, which in turn enhances serviceability, it added. The patent office, after considering the arguments and submissions, observed that the application meets the objections raised and is satisfied that the application complies with the requirements of the Act and found to be in order for grant of patent. The company launched ABS in its flagship product Apache RTR 180 in the year 2011, in collaboration with Continental Corporation, according to reports. The company claimed that with the ABS technology, the motorcycle's stopping distance would be reduced by 10-25 per cent on dry roads and around 20-30 per cent faster on wet roads.